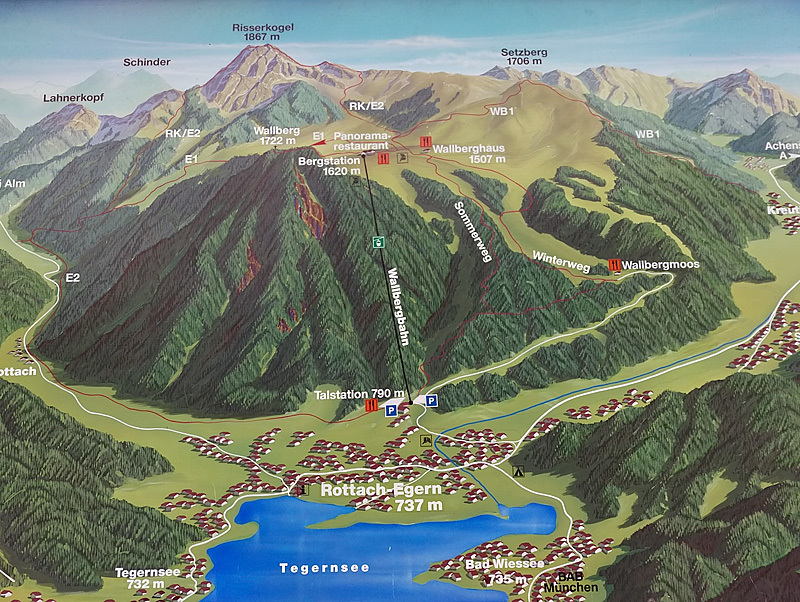 Wallberg Berglauf was my first mountain run. 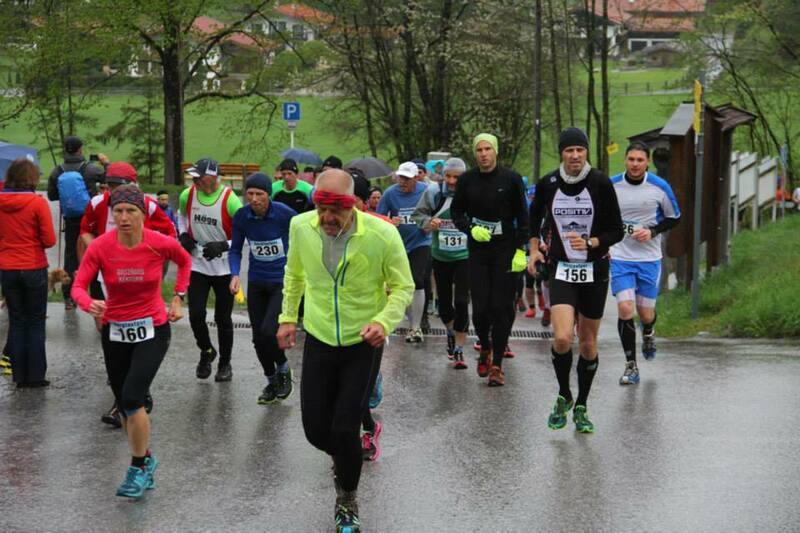 I joined 252 other people on a rainy May 1st morning in Rottach-Egern, near Tegernsee lake in Southern Germany to run/walk 5.5km and climb 860m of elevation. Having taken the day before the race off work, I left for Germany at a reasonable 9:30am. There was quite a bit of traffic on the A8 for the next handful of hours, but fortunately no traffic jams. There were a lot of construction zones though and a lot of the remaining distance had speed restrictions. I could have gone pedal to the metal a handful of times, but why bother? Most people I saw on the left lane invariably had to step on their brakes a few hundred meters later. I arrived at Tegernsee lake after about six and a half hours (including refueling and three more quick breaks), and was a little surprised to see my old trusty Mondeo was reporting a fuel consumption of 4.4 litres per 100km over the past 560 kilometers. Since it was still quite early in the day and contrary to weather reports it wasn’t raining yet, I opted to do a little recon. It’s a difficult gamble: how far should I hike up the day before a race? On one hand, it’s useful to see what lies ahead, on the other hand there’s no need to tire yourself out. After running into the race director and his wife at the parking lot (being the first ever person to participate from Luxembourg makes you stand out when you drive up in Luxembourgish plates), I ended up hiking 5.6km (up and down) and 414m of elevation (Strava activity); which may have been a bit too much. To top things off, I had quite a bad headache. 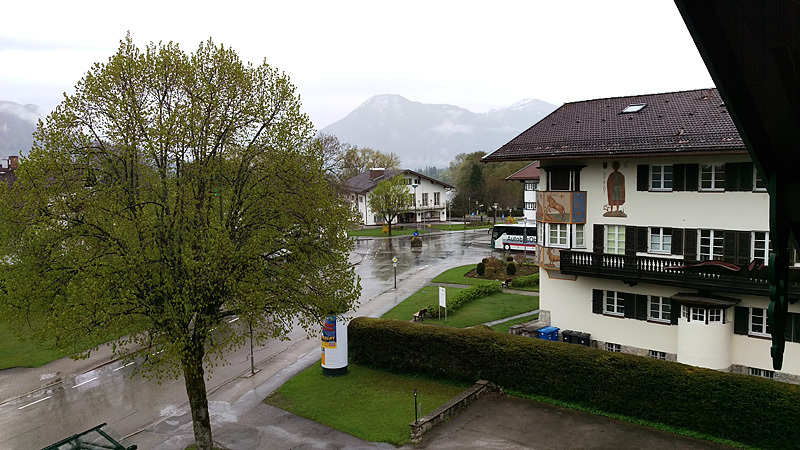 I retreated to my hotel in nearby Bad Wiessee, skipped any dinner plans and was in bed at a record-breaking 18:30. I got up at 6am – definitely can’t say I didn’t get enough sleep. Killed some time on the laptop, showered and was at the breakfast table at 7:45am. Tried to strike a balance between eating enough but not too much, and sampled around 600 calories from the hotel’s breakfast buffet (bread, Nutella, deli meats, small slice of cheese, small yoghurt). A glass of OJ. And of course some coffee. The weather wasn’t stellar: it had been raining for quite a while when I took the following picture in the morning. 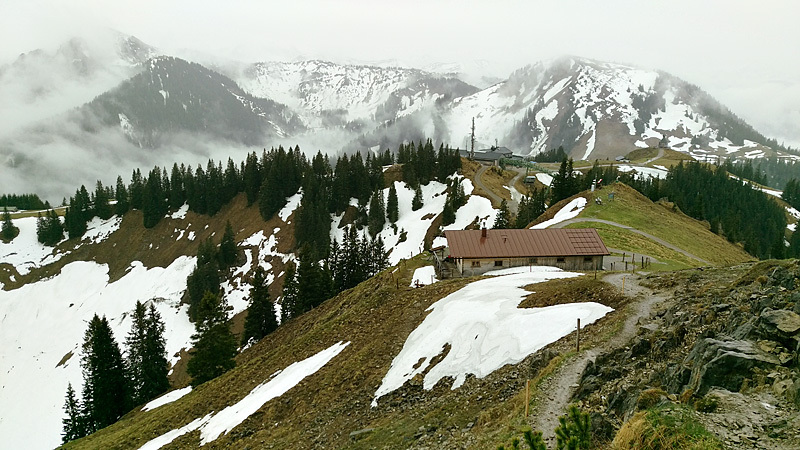 Conveniently, my destination for the day was already in plain view (Wallberg mountain center-left and the race finish at the cable station about 100m of elevation further down). I left my hotel at 8:30, which coincided with the the start of the one-hour window for late registrations and bib pickup. Since I’d signed up in advance, I merely had to pick up my racing number and then had a lot of time to kill before the 10:30 race start. I spent some of it just sitting in the boot under the large rear door of my car (yay for station wagons), pondering what to wear and what to take with me. 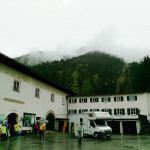 With temperatures of around 10 degrees Celsius in the valley and a reported 5 degrees Celsius at the finish line, I had settled on my Asics long tights (non-thermal) over underwear; a form-fitting Kaikialla functional shirt as a base layer on top and a Brooks long-sleeve running shirt over it. I decided against compression socks, but was wearing normal running socks in my well-broken-in Brooks Cascadia 8. I would also don light gloves and a lightweight buff over my head and ears. As more and more people arrived, it was easy to become distracted with clothing options: shouldn’t I rather wear short tights? Or maybe a rain jacket? Salomon shoes looked popular, but I don’t have any of those. And then, should I take a camera? How about my Gopro? Or maybe skip all electronics except my watch? In the end, I stashed my cell phone in a pocket but left the Gopro in the car. I was sure I’d be plenty busy just moving, never mind about mentally or physically dealing with picture-taking in that stress. I opted against a long warm-up, instead just walking around a little to stretch my legs occasionally, and then jogging a few hundred meters before walking down about 400m from the parking lot to the starting line. I lined up at the start line with a reported 280 participants. The race start was delayed for a few minutes (I guess to deal with last-minute late sign-ups). And then we were off. I’d lined up just before the 55min line (the race director’s 10km equivalent time); which was quite conservative but I neither wanted to get out too fast nor did I want to be in a position where I’d be overtaken (read: be in other people’s way) more than necessary. The first 500m or so were on a paved road; which I guess was a good enough way to get people well spaced.out before the narrower paths start. 2015 was actually the second year this paved part was added to the race, before that people started at the cable station. On my own, I guess I would have started out faster, but since I was pretty much stuck with the pace those runners around me were setting, I just followed that. I hit the first kilometer in 7:24. The first 500m only had about 30m of elevation gain. The change from lounging around all morning to suddenly being in a race was a bit of a shock to me. My head really wasn’t in it at first. The more things change, the more they stay the same – I’ve had the same to say about quite a few 100m starts back when I was competing on the track. 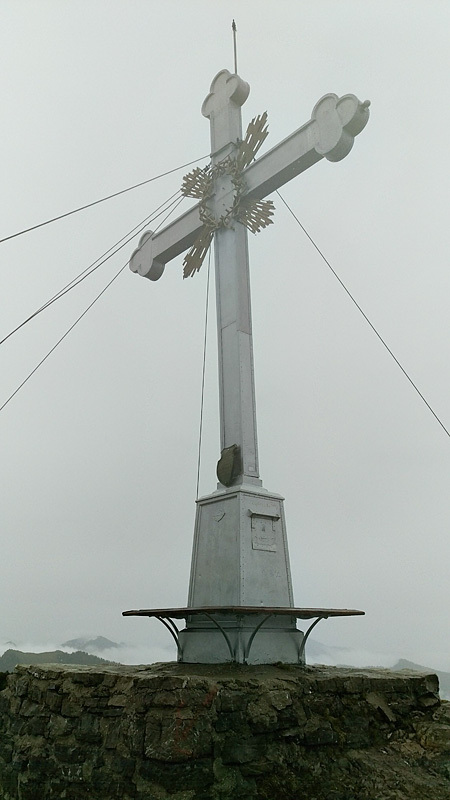 After passing the cable car station on our left, we started climbing for real. I switched over to a fast walk; which still matched the pace of those around me running. After the initial 500m on road and the next 800m on gravel, the next two kilometers (give or take) would be on mountain trails. These were not quite single-track – there usually was enough space for two people next to each other but since everything was quite muddy and there were lots of exposed rocks or potentially slippery stones, there often was one good single track and then one that was slightly worse next to it. While the runners had spaced out a little, things were still quite busy. A few times, you’d need to be careful because there were still a few position changes. I found that I didn’t like running or walking just behind someone, since that restricts your visibility of the trail ahead; so instead I often switched over to the slightly more uneven part of the trail that was maybe a little more slippery and closer to the edge on the right; but afforded better visibility of where I’d put my foot the next few steps and a slightly better opportunity to set my own pace. By the time we hit 2km of distance (and 200m of elevation gain), I was dealing with the onset of a side stitch and just generally not feeling as well as I could; especially seeing how much elevation gain was still in front of me. We passed Wallbergmoos (a small mountain restaurant) after about 2.25km. After traversing a small meadow, the terrain got steeper again. This was how far I’d gone on the previous day during my recon, so from here on out I didn’t have any mental imagery of the course to rely on. From km 2.5 to km 3.5, we followed a number of switchbacks. This was the most treacherous terrain yet, but I got through without too many issues. Well, apart from slowing down some more. Here, I also played leapfrog with at least two different runners, who I passed and who passed me again several times. It seems that my pace is indeed quite irregular; and it almost felt like I was able to push a little bit better on the steeper sections, but they ran faster than my fast walking on the less narrow segments. Maybe I annoyed them because they signed up for a mountain run, and here I was walking a lot of it. After 3.5km, we rejoined a wider path of very small crushed gravel. By here, I’d managed to leave behind one of my co-runners in a yellow jersey; but was once again playing leapfrog with a female runner. For most of the way up, I’d been at a heart rate of 172, so I decided to stay there. But since the climb was less steep here, I was finally able to do some running again. At one point towards the end of this stretch, I even managed to dip below 6min/km pace; but this was short-lived. 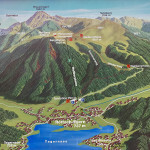 At around 4.6km, the route deviates from the wide path for a quick 100m stretch up a meadow. And “up” is the defining factor here, because the grade is around 30%. My heart rate shot up to 175 and there was nothing I could do. Whereas I’d been thinking that I should ramp up my speed and maybe catch some runners – there were a good 10 or 15 that looked within grasp at that point – this spot took the wind out of my sails. Especially since the remaining distance to the finish line once again felt very steep and I was once again resigned to a fast walk. I could neither catch anyone, nor could I shake off the female runner I’d been exchanging positions with for a while now. Finally, we neared the top of the race. I was thinking if I should make a move for that one position because everyone else was out of reach now. Just when I had decided to stay behind she slowed down for a second or two, so I went past almost naturally. The last 100 meters or so were on a meadow and because it was flatter I was once more able to run into the arrival chute where our bibs were scanned. I thought I’d put some distance between us, but in the results there’s only 1 second of difference. Oh well. I stopped my watch just shy of 55 minutes. This was later confirmed when the official results were put up; where I was listed with 54:46. After crossing the finish line, I sat down on the ground for a minute. I regained some energy almost straight away, and actually, this happened way quicker than I expected it to; which either means I didn’t give everything on the race or my recent training efforts have made me more resilient. 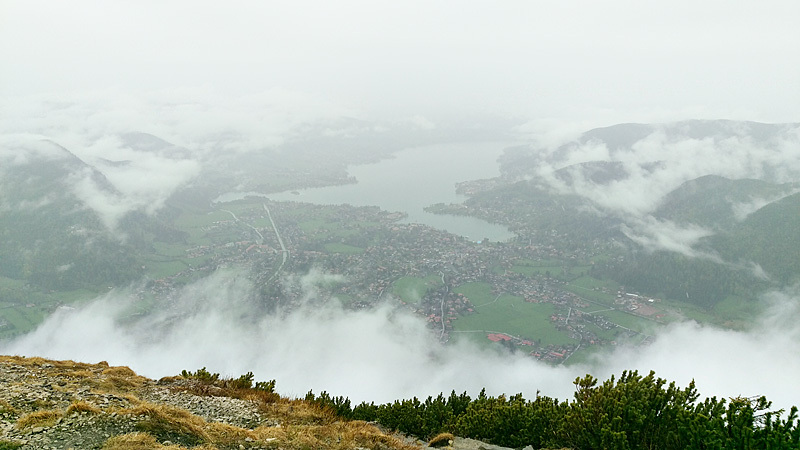 Either way, I thought since I was already most of the way up to the peak of Wallberg, I might as well run/walk there. To my surprise, none of the runners I had been around joined in; so I made it to the top almost in solitary (I encountered one runner and two hikers climbing down). 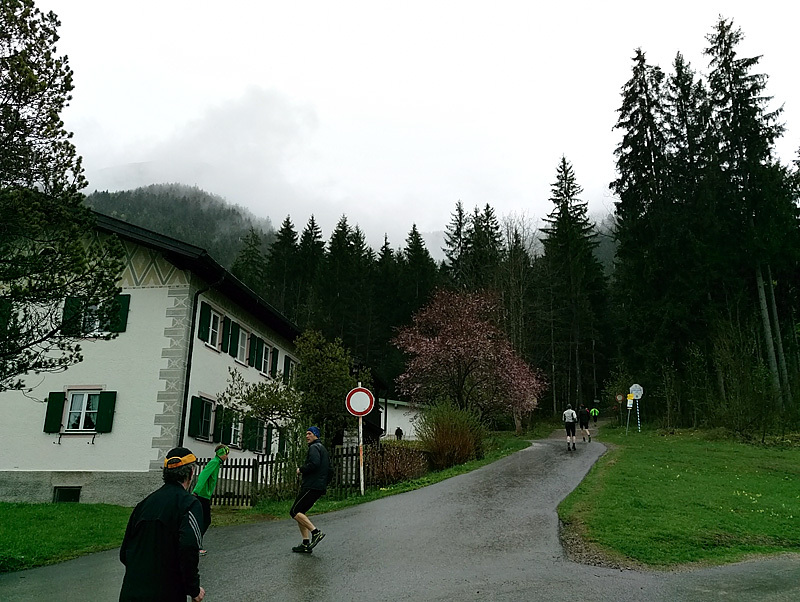 And half-way up the remaining distance, I understood why the race doesn’t go to the top of the peak: it was quite slippery; and it required more scrambling than some runners might be comfortable with. At one point I even had to do some easy climbing moves, but i guess that was more because of my poor route choice in that spot. The climb to the top added 12 minutes to the climb and another 137m. Which means I failed to hit 1000m of elevation gain; although just barely. On the way down, the rocks I’d scrambled up on were very slippery, and I had to be very careful not to fall. Actually, I slipped once, and just barely was able to prevent my rear from making an unplanned contact with the ground. Good thing I was wearing gloves, because my hands made full contact with the muddy trail and rocks to break the fall. Of course by the time I got back to the official finish, everyone had arrived, and the finish zone was already starting to get torn down. 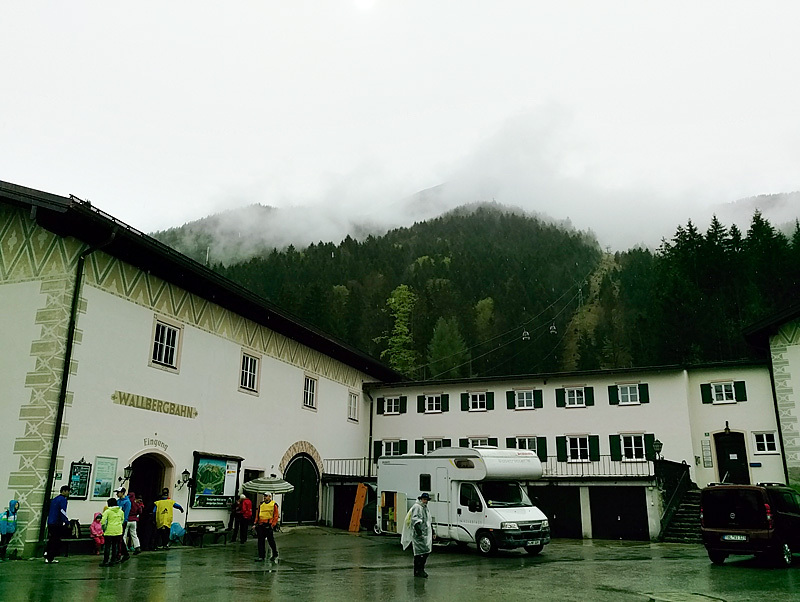 I got something warm to drink, then retreated into the cable car station to change into my warm clothing (which had been sent up by cable car – a welcome service). And of course with everyone across the finish line the restaurant was packed by now. 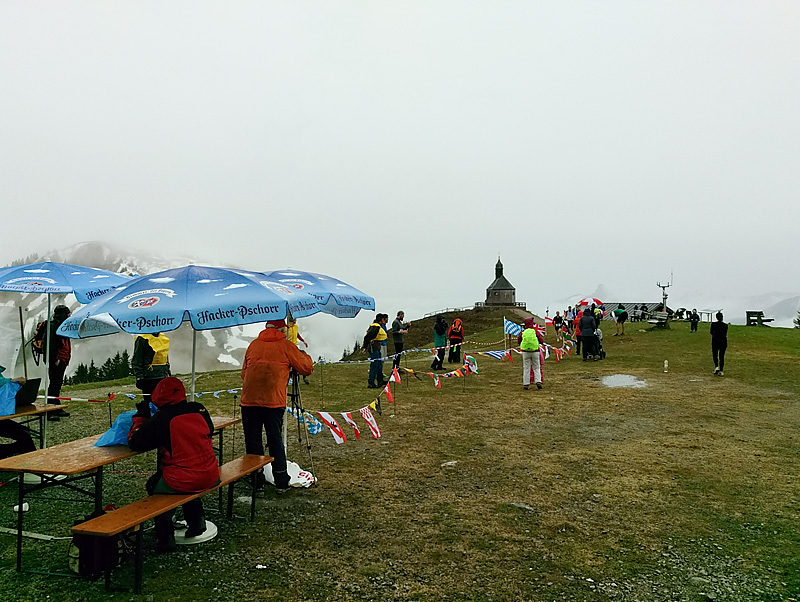 The race fee includes a free meal (Kaiserschmarrn), so I opted to stay and hang around for a bit. I ordered a coffee with the free meal, but was a little surprised to pay 4.20€ for the coffee. This seemed a little steep. Before the victory ceremony, there was a raffle being held. My bib number ended up winning a pair of socks. It’s just a small thing, of course, but I guess as a runner you can never have too many socks (even if these, being white, are not the best colour for trail runners). At around 14:00, the race organiser announced that the official results would be put on the walls in the staircase outside the restaurant. I decided to go look – I guess deep down I’m still as competitive than I was as a sprinter, and want to know where my performance puts me. And then suddenly I decided I’d had enough of the crowded restaurant and people in general and opted out of spectating the victory ceremony (which I couldn’t see from my seat in the restaurant, anyway) and took a cable car down before everyone else would do so. Thumbs up to the race organisers and volunteers. It’s a very nice event and I’m glad I made the drive down from Luxembourg. The weather could have been better, but at least it didn’t snow. I’m happy with my performance to the extent that it was my first participation at an event of this kind. My time puts me at position 136 of 253, which means I’m somewhere past half-point in the results. The time, coincidentally, is near my “reasonable” expected time; but of course much slower than what I feel I should be capable of doing if I keep training for events like these. So in summary, I liked today’s event and am looking forward to returning either here or similar events in the future.